The ability to live a fulfilling life with your ostomy with all the products on the market is a matter of caring for your ostomy (colostomy, ileostomy or urostomy) appliance and skincare. Aside from using the proper pouch appliance, peristomal skin care is crucial. It’s always important to be proactive as opposed to reactive when it comes to caring for your ostomy. If proper sanitary conditions are maintained, you will minimize any potential health problems you may have therefore keeping and maintaining your quality of life. Since your skin around your stoma is prone to skin problems, it is critically important to make sure the area around your stoma is free of bacteria and moisture. Problems such as rashes and infections are caused by moisture accumulating, possible allergic reaction to certain adhesives, and a buildup of normal fungi. The best way to prevent any serious complication is to address any problem early on. Normal, healthy skin around your stoma should be clear and intact. The adhesiveness and durability of pouching systems can differ. You can expect to wear your appliance anywhere from 3 to 7 days according to ostomy.org. You should check your pouch occasionally to make sure it’s not getting too full therefore causing a leakage problem and possibly irritating your skin and/or stoma. If there is any itching or skin irritation, that’s a good time to consider changing. When changing your pouch it’s a good idea to use items such as Coloplast Brava Ostomy Skin Barrier Spray or Wipes, they provide skin protection from the output and reduce skin problems associated with body waste and adhesives. Since there are many variants of ostomy appliances, you should work with your doctor or ostomy nurse to determine which fits you properly. Over time, your stoma may shrink in size, therefore, requiring a different size pouch. Also, manufacturers offer ostomy belts which hold your pouch system in place. Products such as Nu-Hope Cool Comfort Elastic Support Belt come in a variety of sizes, not to mention left/right stoma options. These belts allow you the flexibility to keep your pouch system in place securely no matter where your stoma is located. When used in conjunction with adhesives such as Torbot Double-Sided Adhesive Discs or Convetec Stomahesive Moldable Strips, your pouch system is held firmly in place, therefore, minimizing any complications that may arise. 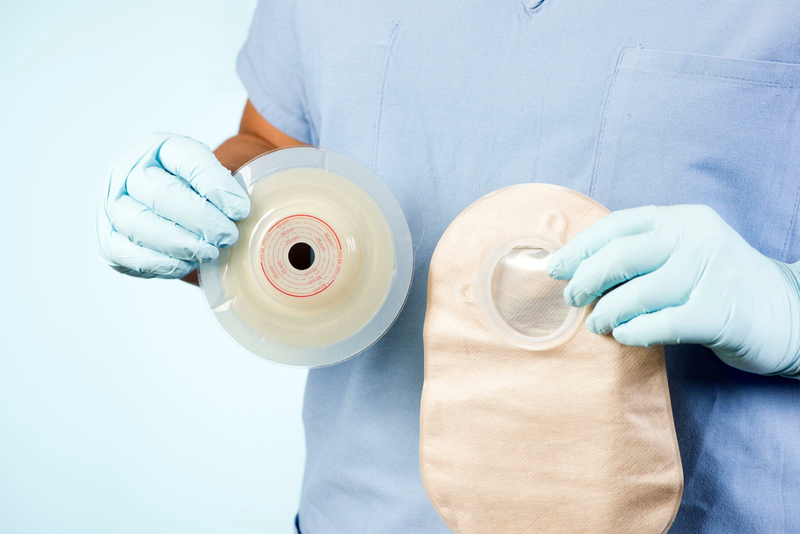 Today’s ostomy patients don’t have to worry about living with the stigma of wearing a pouching system and having it infringe on their lifestyle. Manufacturers such as Options offer both men’s and women’s undergarments with built-in ostomy support. A couple of examples of ostomy garments are the Ladies Adjustable Basic Cotton Crotch with Built-In Ostomy Support and the Mens Built-in Ostomy Support Undergarment. These allow the wearer to support the ostomy pouch securely against the body, relieving pull on the stoma seal and prevent leakage, burning, and itching. They also absorb moisture preventing skin breakdown from pouch and wafer. Other items like Tytex Carefix StomaSafe Classic Ostomy Support Garment support the ostomy pouch allowing the wearer to live an active life.